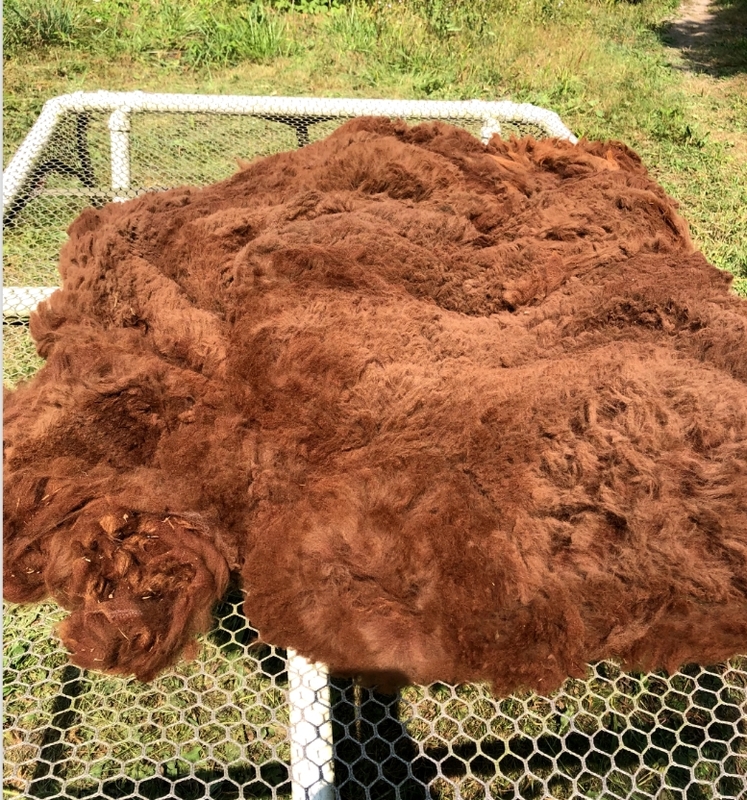 I have been hand-processing my Alpaca's fiber since 2006. I thought I would share with you how I do it. Alpaca fiber does not have any lanolin in it, but it does have a lot of dust and dirt from them rolling in their dust bowls as you can see in the picture below. During the shearing process we collect the fiber in three different bags. 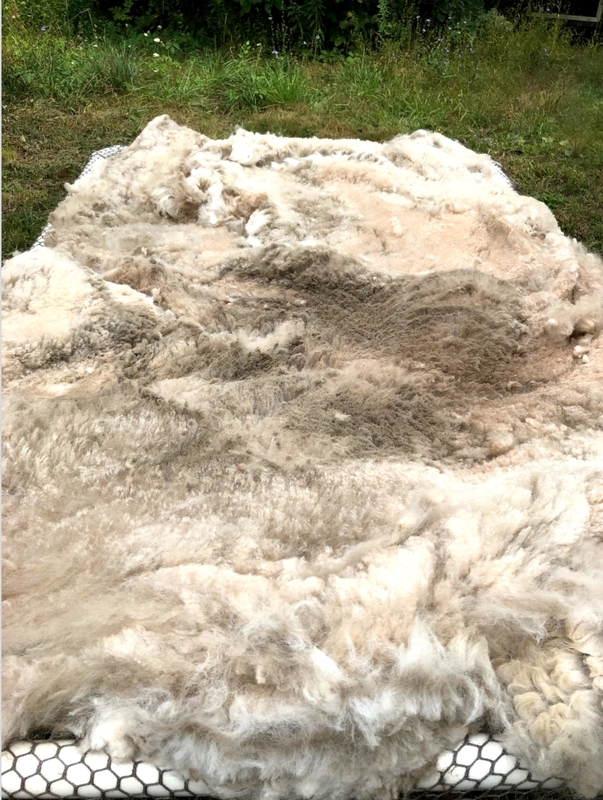 The main blanket, is tagged with the alpaca's name and number 1. The neck and some of the other fiber as number 2 in a separate bag. Then the leg fibers go in a bag numbered 3. I take the number one bags and place on my skirting table. From this I pick out any hay, pickers or whatever might be in the fiber. I also pull out any shorter fibers. 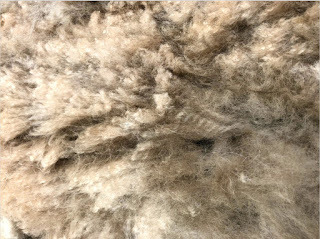 As you can see in these pictures my alpacas fiber is very dirty from rolling in their dust bowls. After skirting we use a homemade "blowout box" and a leaf blower to blow out most of the dirt and dust. 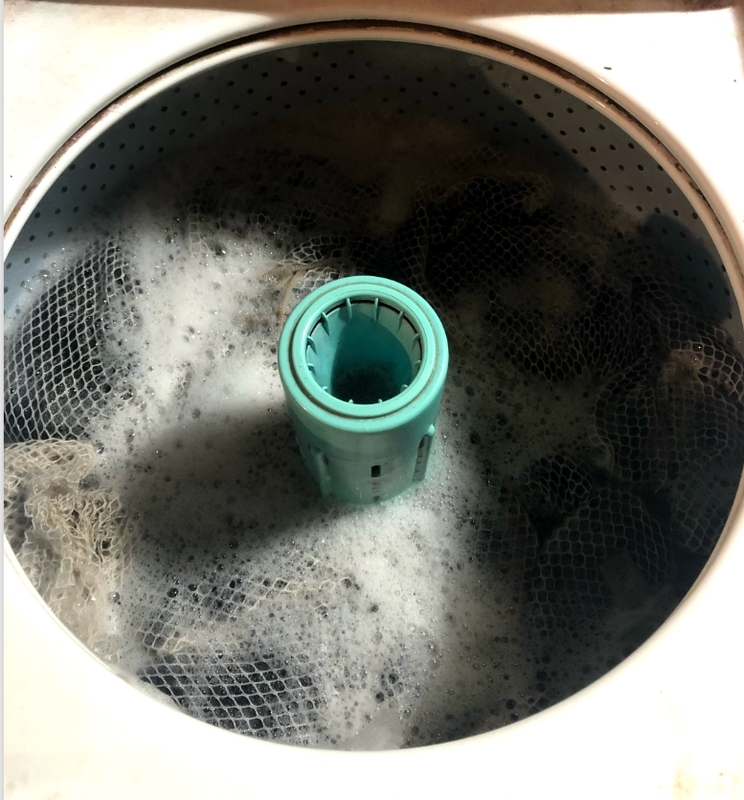 This helps with the next step of washing. I place the fiber into laundry bags that you can close up with a drawstring. Depending on how much fiber I usually have it separated into 3 laundry bags. Now it is ready for a soak. 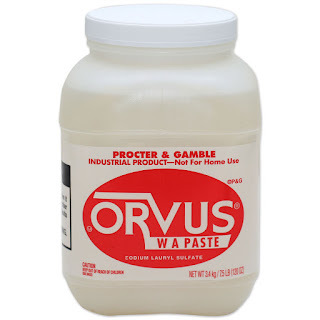 I like to use Orvus Paste. It is a non PH shampoo (typically sold in farm supply stores). Horse owners like to use this to wash their horse with. You may also purchase smaller quantities in quilt shops as it is used by quilters for washing their quilts. It also can be used to wash your delicate clothes. 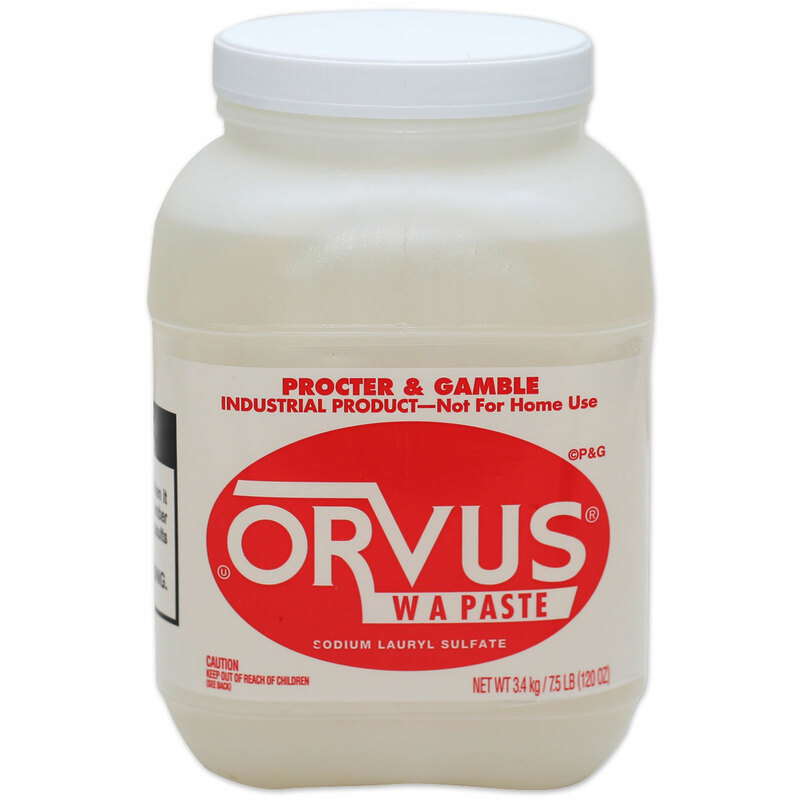 A little Orvus Paste goes a long way. I scoop out a half a ladle for a full wash load for my fiber. I then take it out of the bags and place in this herb/seed dryer trays. 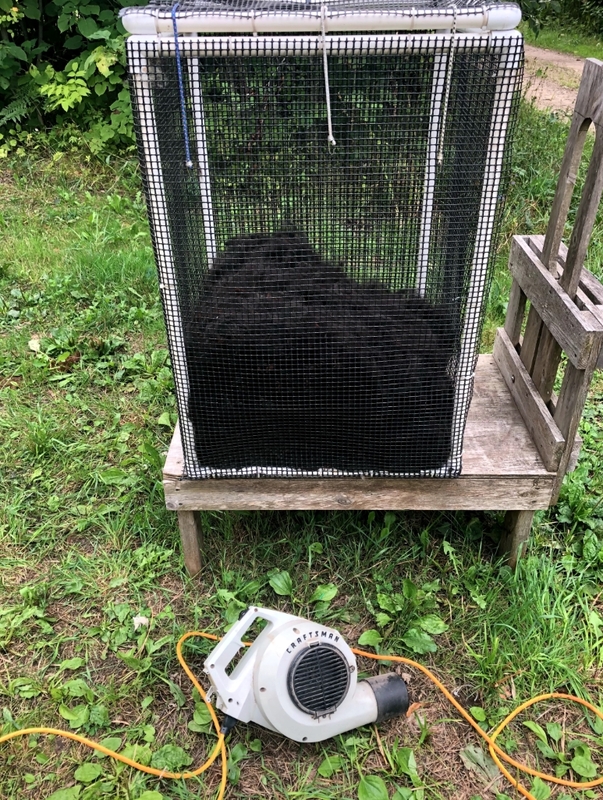 This is hanging in my basement with my setup for washing and processing the alpaca fiber. So this is how I do it. I have never felted any of my fiber by washing with hot water. If you were to agitate with the hot water and soap, then yes you could have a felted mess. If you try this, please remember no agitation allowed! Hi Strangers! Guess who? It's me, Liz. Yes, I know I have not posted here in a very long time. Life just got in the way. I now have a few extra minutes to start again. 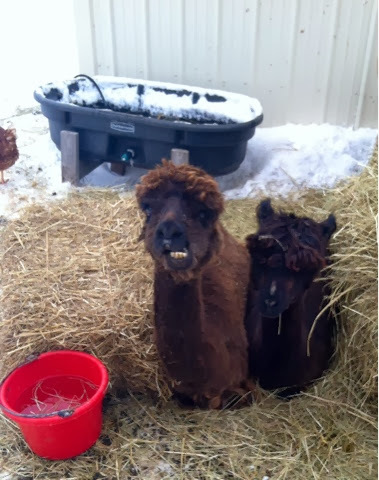 For an update on the ranch-we currently own 32 alpacas, some chickens, and have added Muscovy ducks. We have 4 new Maremmas' LGDs. Two of our older dogs passed this last winter and Pan now lives in the house with us. He has hip issues and is slow because of his age. He is 13 years old. So we needed to add some young blood to guard our livestock. Here are some current pictures from the ranch. We give Mother Nature, We are crying Uncle. Enough is enough already! It has been blowing & snowing here for three days now. 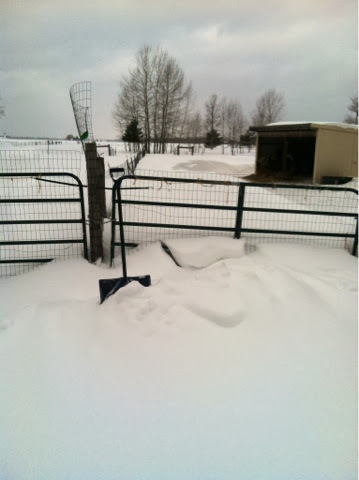 When the wind blows out of the west, the snow piles into the Alpaca pens. 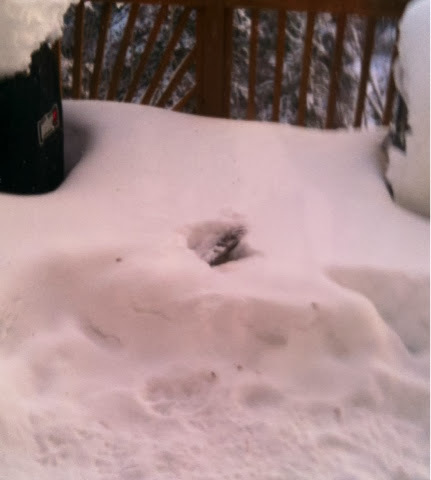 Here are some pics of the drifts of snow. 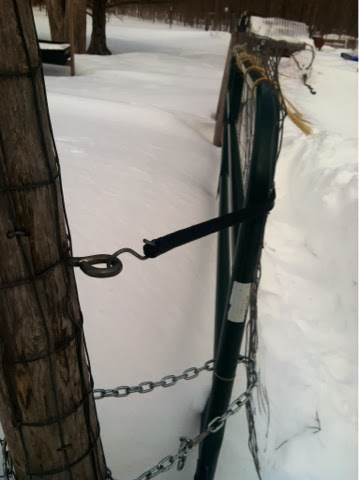 We have to dig out the guys gate to get into them and the chickens. 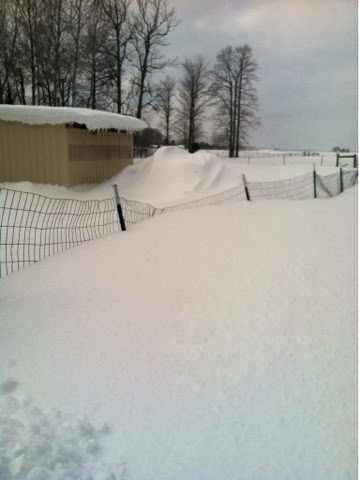 The drifts are almost over the 5 ft fence between the girls & guys pens. 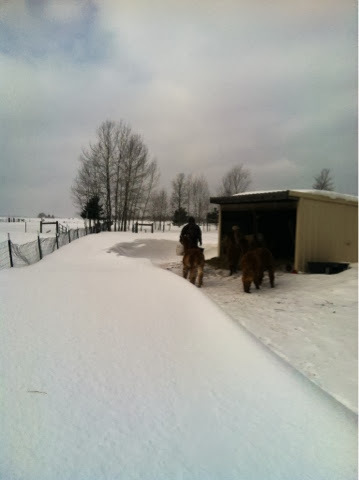 Thank goodness the Alpacas do not like getting into deep snow, because they could easily walk over the fence. 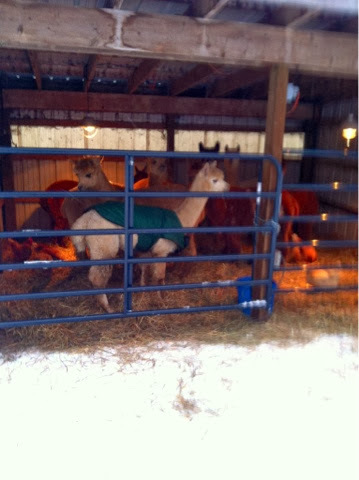 Here is a picture of Gary and the Alpacas as he ventures into the pen to get to the chicken coop. Notice how high the drift is compared to him? It is supposed to blow even more this afternoon. Once it stops blowing, we can get the tractor in and start the digging out. We sure will be glad when this winter is over. Lady Liberty is smiling for her picture. She doesn't seem to mind the weather. Help us please to receive a small business grant. Well it sure has been a very long, cold , snowy winter so far. It has been tough both on us and some of our animals. It seems everyday we are "digging out" of the snow and drifts, just to take care of them. 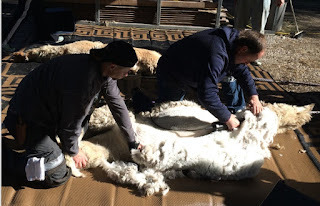 We now have two alpacas that are getting special care daily. One is Sir Prize as he is having issues with arthritis in his legs. I now have him on a natural arthritis formula for alpacas daily. 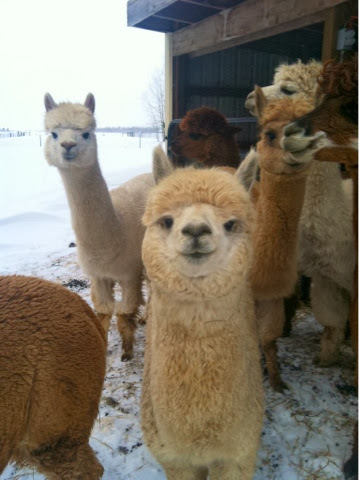 Our other Alpaca snowflake, has hurt her leg either by slipping on ice or getting into the deep snow in their pen. Usually they do not like to walk in deep snow. We now have her and the girls in their shelter full time, until she gets better and the weather warms up. It was -12 below this morning again when we did chores. 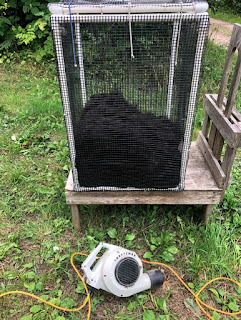 I have been spinning, knitting, weaving and washing lots of fiber to process into batts. 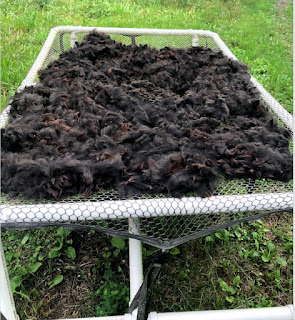 My dream has always been to have a full service fiber mill, not only to process our fiber, but to offer services to other artisans and farms Recently we have found a mill that is going out of business and is selling their equipment. We are now working on updating our business plan and hope to get a loan and some small grants. Today we were notified from Fed Ex that we were accepted into their small business grant contest. We are getting into this a little late, but are hoping that we can get enough votes before Feb. 24th to qualify for the 100 finalists. We sure can use all of your help. You can vote once a day for us and share this among your social networks. Thanks for voting and spreading the word! Here is a link to the site. Snowflake is in the jacket with the girls in their shelter. Sometimes living and working in N. MI can be a challenge. We love it here, but there are days, I think living on a sailboat in the tropics, would be a lot easier. We have had a lot of problems these last two days. Yes, we do expect to have very cold weather and snow, but it seems it has just been so much of it this winter. 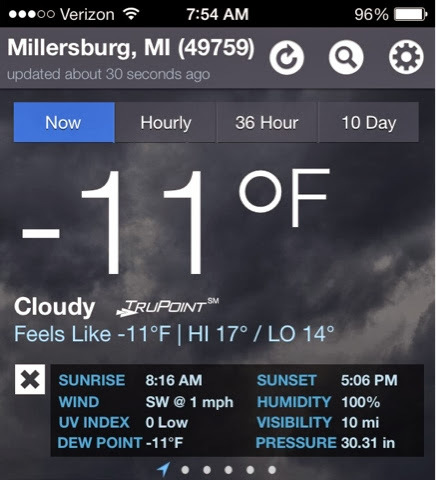 Friday morning, our temperature was this when we went outside to do chores. We decided to drive the Blazer down to the barnyard with two 6 gallon jugs of warm water for the animals. As I was driving up the driveway, I slipped into the ditch alongside of the drive. My 4 wheel drive would not engage, so I was stuck. Gary & I decided to leave it there for the moment and to continue with the chores & checking on the animals. He would bring the tractor down later and pull it out. After chores we walked back to the house. While we were in the house, we heard a big bang and then a pop! 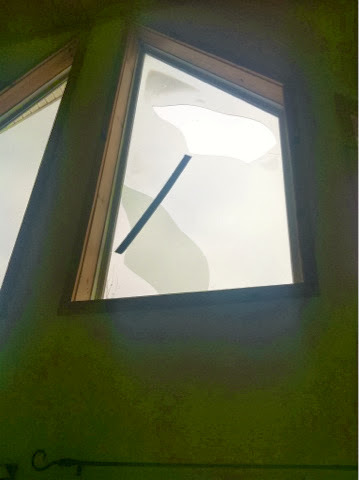 One of the large windows in our house had broken. This bird had flown into it and broke it's neck! So I had to make a few phone calls to get that replaced. In the mean time my husband left for town to deliver eggs and do some work at his customers. 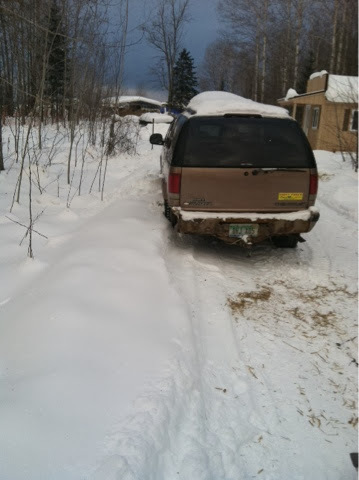 When he arrived home later that day, we went to get the Blazer out of the ditch. 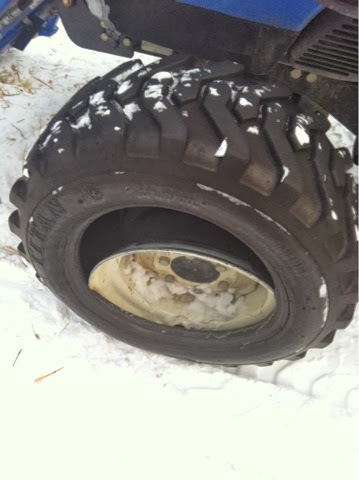 He turned the corner and his tire rolled off of it's rim on the tractor! Now we have to get the tire fixed! So we decided to continue with the chores, go back to the house and call it a day. After all tomorrow would be a better day. Now it is Saturday morning. The plan was to get the chores done and for Gary to take the rim and tire off to get it fixed at a business in Rogers City that closed by noon. So we get to the barnyard and find Sir Prize, one of my first male Alpacas down on his side. It looks like he slipped on the snow and ice. He just couldn't get back up. He has some arthritis in his back legs. So we managed to get him into a shelter and under a heat lamp, and throw an old sleeping bag over him to quickly warm him up. We fed him his grain, hay and water right there. He literally was served breakfast in bed. He seems to have hurt one of his legs in the fall. We are keeping him there resting for now. So we continue with the chores. After the chores are done. Gary takes the tire off of the tractor and puts it into the back of the truck. He has an hour to get it there, which will take about 20 minutes to drive to Rogers City. So he left. I went back to check on Sir and he was on his side again from trying to get up. I couldn't get him rolled back up and cushed. I called Gary on his cell to come back and help me. Gary had not gotten far as he was still on our private road. He started to back up and his truck hit a patch of ice and now he was stuck in the ditch! 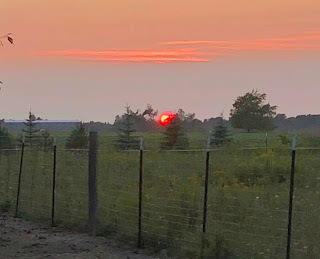 He came walking up the drive to the barnyard grumbling something I should not repeat here on the blog. Here is a pic of the end of the drive with broken down and stuck vehicles! Gary & I get Sir situated again. 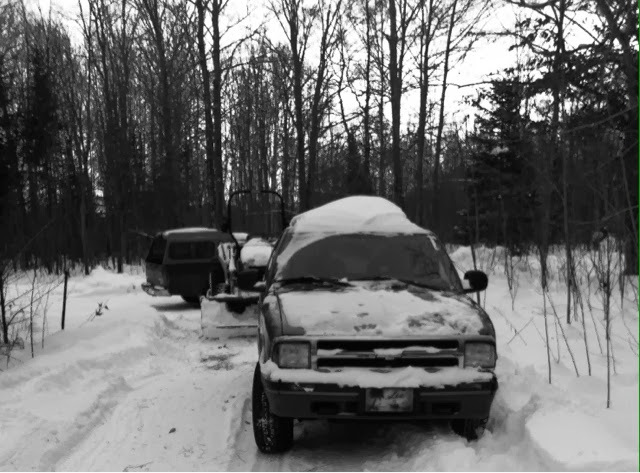 He grabs a shovel and he tries to get the truck out. No luck. So I decide to call our good neighbors Mark & Sherry. Of course Mark comes with his tractor and pulls both of the vehicles out for us. They referred a man here in Ocqueoc who fixes tractor tires on your farm. So I called him and he came right over. He wanted to warm up the tire to fix it and he took the tire back to his place and delivered it when it was done. What good local service and wonderful neighbors. 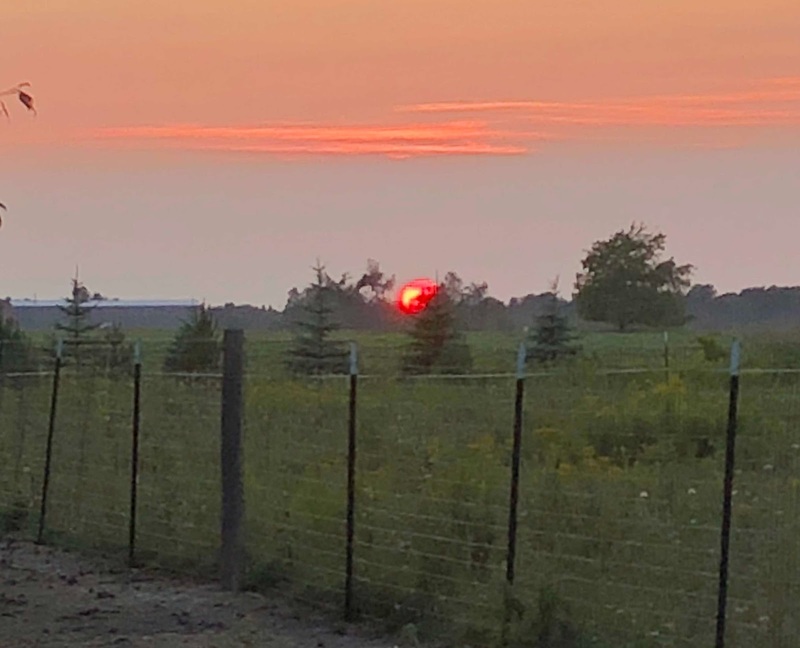 Another reason we love living in the country. Everyone helps each other. I hope this is the end of things breaking down, Alpacas falling, and us getting stuck in the snow! Now I need to get the 4 wheel drive fixed on the Blazer.